Rahul Gandhi the yuvraj of 125 years old congress party. rahul Gandhi got his siyasat by virasat. Born on 19th july 1970. He is active in politics for seven years. He entered into politics in the year 2003 six years after her mother Mrs. Sonia Gandhi joined the AICC in the year 1997. 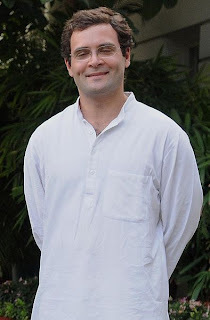 Rahul Gandhi since his entering into the party remained an eminent and very active member of national congress party. Under his supervision two wings of youths and students get a strong hold and their members increases many fold. The two wings INDIAN YOUTH CONGRESS and NATIONAL STUDENT UNION OF INDIA now has several million members, which earlier had about some hundred to thousand members. These yuva morcha is now fully active in politics of india. This all youth congress committee started in the year 2008 and joined the mainstream of politics. In the year 2011 rahul Gandhi was arrested by the mayawati government on 11th may, as he was supporting the farmers agitating for their land. He demanded for higher pay to the land owners, whose land were acquired for the highway project. Rahul Gandhi now of 41 years and 7 years in active politics is the favorite choice of Indian citizens for the post of prime minister. According to a survey conducted by star news and other leading magazines, rahul Gandhi scored 21% of votes for the candidature of prime minister. Which is higher than Dr Manmohan singh’s 19% of votes, Where as her mother Mrs. Sonia Gandhi scored about 14% of votes for the post of prime minister. The opposition party BHARTIYA JANTA PARTY has two members for the candidature of prime minister. Narendra modi with 12% and sushma swaraj with 2% of votes for the post of prime minister.